Azure Striker: GUNVOLT has been developed and produced by the company, INTI CREATES CO., LTD and was released worldwide in August 2014. Azure Striker is a side scrolling 2D action game, which is a shame as it doesn’t make use of the Nintendo 3DS’s 3D effect capabilities, but the manufacturers claim that the intense and enthralling nature of the game more than makes up for this. Apparently ‘The hero’s agility and control over lightning create a fresh approach to the genre that gives the player a unique feeling of speed and power.’ This Mega Man inspired game certainly seems as though it might be a real contender in late 2014 and 2015. The design and the characters all feel very familiar, and the activities that are completed in the game do too, but the similarities stop there because Azure Striker: GUNVOLT feels like a totally different game to play. You are a hero clad in blue with a weak projectile weapon , you can jump, wall jump, blast and dash as you fight through torturous levels and battle end of level baddies before taking on the final gauntlet. All pretty standard for side scrolling action games but the game just feels fresh and exhilarating. All of the controls are very precise and delicate, meaning players need to be switched on to complete these levels without jumping into something unpleasant. The fast paced nature of the game continues throughout with various levels requiring players to evade rising water levels by moving from ledge to ledge and ladder to ladder. There is absolutely no time to pause for thought in this game, and doing so will probably result in game over. The graphics and soundtrack are excellent, really making players feel as though the game is similar to the Mega Man games of old, but they are crisper and more engaging than before, adding to the very demanding game play to create a properly enticing gaming experience. 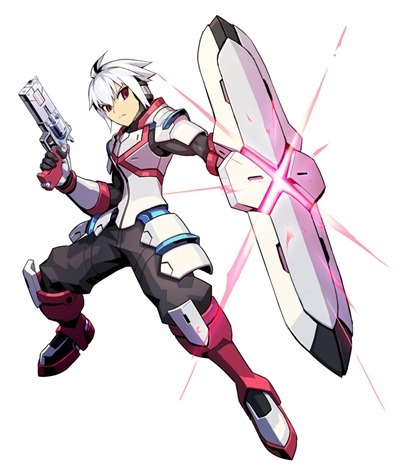 One of the main additions to this game is hinted at by the name, GUNVOLT. When the hero shoots a projectile at a baddy, this deals a small amount of damage but more importantly, it also marks the enemy with a tag. This tag then allows GUNVOLT to use an electricity strike on the enemy in question, dealing massive amounts of damage. It is this addition that really brings the game to life. The electricity effects are dazzling. Overall, Azure Striker: GUNVOLT is a quality game. Great graphics and an even better soundtrack are complimented by a completely revamped gaming engine, allowing GUNVOLT to perform moves and attacks that simply weren’t possible with older Mega Man editions. The game is difficult, but not impossible to get good at, making it a genuinely fun and rewarding game to play. Battle your way through levels, beat the bosses then give them all another good hiding before you battle the ultimate boss. Definitely one for the Christmas list!